Facebook Fan Pages are the hottest thing on the web right now! Business owners, movie stars, and even churches are finding that a Facebook Fan Page can radically change the way they interact with fans. Not to mention the viral marketing exposure for those that have a Facebook Fan Page. Basically the more your “Fans” interact with your page, the more your page is exposure to their personal friends on Facebook! However, promoting your Facebook Fan Page can be a bit challenging if you don’t know what you’re doing. Read my detailed “How To” for creating a Facebook custom username here. Get the abridged version below! ** NOTE ** You must have at least 25 fans of your Facebook Fan Page to be eligible for a custom username. A custom username is now pretty easy to come by on Facebook. And in fact, this strategy works great for your Facebook Fan Page AND your personal Facebook profile. Now that’s a lot of numbers, words, forward slashes, and whatever else is going on there. Also a custom username for your Facebook Fan Page makes it easier for you to tell others how to get there (again, look at the 2 addresses above for example). 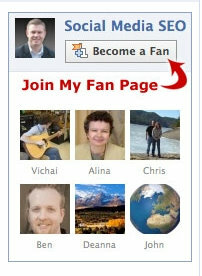 The way you create a custom username for your Facebook Fan Page (and also your personal profile) is by first visiting . Read my detailed “How To” for adding a Facebook fan box here. Go ahead and click that link, and you’ll be taken to the dashboard for your “Fan Box”. There are a lot of ways to customize this fan box, but you’ll see 2 easy edits right in the dashboard and these are “Streams” and “Fans”. If “streams” is clicked, then the comments from your Facebook Fan Page will be included in your Fan Box. And obviously, if it’s not clicked they won’t. The same for “fans” – if it’s clicked, then your default number of fans is 10, and if it’s not clicked then you won’t see any fans. If you look at the right hand side bar of this site (just look right), you’ll see my Facebook Fan box. This is the standard box without “streams” checked, but with “fans” checked. Once you’re done selecting “streams” and / or “fans”, there are options for embedding into your Blogger blog, TypePad blog, or other. If you have a WordPress blog, then select “other” and then highlight the code in the text box that will appear. Then take that code and embed it into a sidebar widget, or wherever else you want to present your fan box. You can learn about more advanced customization by visiting this link. This is a the Facebook developers platform with instructions for you to customize the code. It’s actually quite simple once you see how the different elements are working. A lot of people have yet to realize that Facebook now allows people to send a text and instantly become a fan of Facebook Fan Pages! Go to your Facebook Fan Page, find the word “more” (it’s in small blue print), click that and a drop down menu will open. Look down that menu and you will see “Get More Fans with SMS”. That’s really the only restriction. If you have your own username for your Facebook Fan Page, then you’ll see this feature present. You can start telling others about, and you can even put a quick note on your blog or website with instructions on how to text to become a fan. Look at the top right of this blog for an example. The only other thing to remember with the “Get more fans with SMS” feature is that text rates do apply. 4) Add a custom Facebook Fan Page banner to your Facebook profile. This one is my favorite! It’s been a point of contention since Facebook Fan Pages launched that Fan Page owners had no way to promote their Page to their personal friends on Facebook. The “Add Fan Box To Your Site” does not embed into a Facebook profile. And without that, how else is someone suppose to promote their Facebook Fan Page to personal friends on Facebook? People don’t want to be emailing their personal friends all the time talking about their Fan Page – most would perceive that as inconsiderate. We finally had enough people ask about “how to promote my Facebook Fan Page from my Facebook profile” that we decided we were going to find a way – someway, somehow, to make this happen. There you can see the banner image for my Facebook Fan Page directly underneath my friends on my personal Facebook profile. Since adding this image, my fans on my Facebook Page have more than doubled! The image is custom made with a screen shot of actual fans from your Facebook Fan Page, and designed to resemble the actual “Fan Page Box” that Facebook provides as a widget. Having a Facebook Fan Page for yourself, your business, and your organization is a powerful way to engage fans and interact on a personal level. The interaction that is generated on Facebook Fan Pages is invaluable to the marketing and exposure of your Facebook Fan Page due to the viral marketing effort of Facebook. Remember that you need at least 25 fans to create a custom username and URL for your page. But once you hit 25, make sure you get in there and pick up a custom. Finally, if you are interested in having us create a Facebook Fan Page that you can add onto your Facebook Profile and promote your Fan Page to your Facebook friends, then let me know in the comments below or you can always reach me @ 706-363-0335 (Robert). Hi Robert — great ideas. My Notes From a Dreamer on Dreaming Fan Page reached 25 fans this past week — up to 37 now (thanks to an online conference where I promoted my page whenever I could). I created my custom username and I would really like to promote my Fan Page on my Profile. What do I need to do? Hi Bobbie – make that 38 fans now (I just became a fan!). And I like your use of the landing tab for "non-fans" – very nice! We help people promote their Fan Page on their Profile by building a custom image for your Fan Page (see above), and then implement that image into your Profile so the image is directly under your "friends" section. The image will be customized so that it shows actual Fans of your Page, and of course it will link directly to your Fan Page from your Profile. We are seeing great results (increased Fans) with these custom images being added to Facebook Profiles. It's only $100 to build your custom image and set the entire thing up for you. Are you interested in proceeding with this? Hi Bobbie – make that 38 fans now (I just became a fan!). And I like your use of the landing tab for “non-fans” – very nice! We help people promote their Fan Page on their Profile by building a custom image for your Fan Page (see above), and then implement that image into your Profile so the image is directly under your “friends” section. The image will be customized so that it shows actual Fans of your Page, and of course it will link directly to your Fan Page from your Profile. It’s only $100 to build your custom image and set the entire thing up for you. Oh, my ego says go for it, but the wallet is telling me "no". Unfortunately, I have been unemployed for almost 18 months now so money is really tight. I'm hoping build a fan base so that when why ebook is ready, I'll have an audience for it. Right now there's no money coming in from it. Maybe in a while I'll go for it as the date for the ebook approaches. And … Thanks for becoming a FAN! Hi Bobbie – how is everything working out with your Facebook Fan Page? Are you working it to make it active and are you seeing an increase in fans? Looking forward to hearing from you! Wow Marian! You're the best… thank you so much for your words of encouragement. 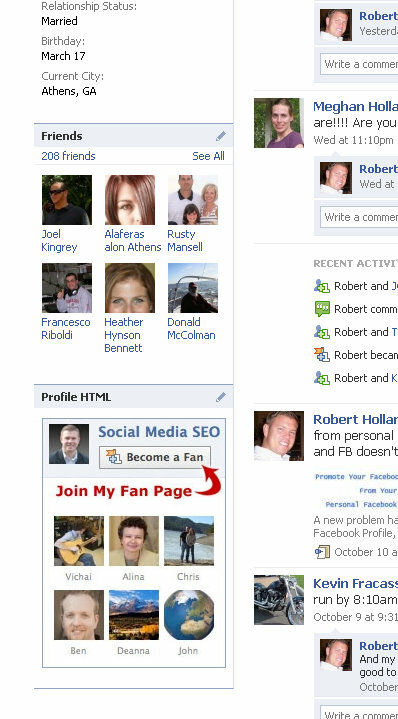 I'm always trying to find new content to write about regarding Facebook Fan Pages and online marketing. Thank you so much again Marian for commenting and your words of encouragement – they are a blessing to me!